Searches for double beta decay of Xe134 were performed with EXO-200, a single-phase liquid xenon detector designed to search for neutrinoless double beta decay of Xe136. Using an exposure of 29.6 kg·yr, the lower limits of T1/22νββ>8.7×1020 yr and T1/20νββ>1.1×1023 yr at 90% confidence level were derived, with corresponding half-life sensitivities of 1.2×1021 yr and 1.9×1023 yr. 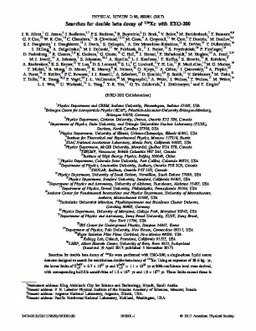 These limits exceed those in the literature for Xe134, improving by factors of nearly 105 and 2 for the two antineutrino and neutrinoless modes, respectively.